The National Rifle Association has two enemies: politicians such as New York Mayor Michael Bloomberg and video games. Bloomberg, the co-chairman of Mayors Against Illegal Guns, wants stronger restrictions on gun sales to discourage gun violence. The popularity of video games that offer realistic urban gangster and military warfare experiences can keep young people away from shooting ranges and hunting. Keene’s adversaries reflect the dual purpose of the NRA, which is to protect Second Amendment rights while preserving shooting sports through education and conservation. Keene said the Virginia-based interest group, which has 4 million members nationwide, spent about $30 million on political advocacy before the elections. The NRA did not achieve its goal of defeating Hawaii-born President Barack Obama or establishing a clear gun-friendly majority in the U.S. Senate, but kept a pro-gun majority in the U.S. House. The U.S. Supreme Court, in landmark rulings in 2008 and 2010, held that people have a fundamental right under the Second Amendment to keep and bear arms for self-defense and that the right extends to states and cities. The court rulings limit the government’s ability to restrict gun ownership. But Keene said he does not believe that the growth in shooting sports, driven mainly by women drawn to guns for self-defense, is because of legal or political progress. According to the U.S. Fish and Wildlife Service, which conducts national surveys every five years, the number of people who hunted in 2011 was up 9 percent from 2006. Both hunting and fishing had previously been in decline since reaching a high point in 1991. In Hawaii, firearm registration has hit record levels. Gun registration in 2011 was up 17.2 percent over 2010, according to the state Attorney General’s office. From 2000 to 2011, the number of guns registered in Hawaii increased by 170 percent. Keene, who attended the Friends of NRA banquet in Kaneohe on Sunday and made other appearances in the islands, credited hunters for their role in conservation. “Great conservation strides in this country haven’t come from tree huggers from Vermont, they resulted from the concerns and desires of hunters, who are the people who are the real conservationists in this country and always have been,” he said. Keene, who became president of the NRA last year, is a leading conservative who was chairman of the American Conservative Union for more than a quarter century. 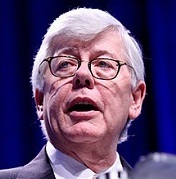 The American Conservative Union sponsors the Conservative Political Action Conference, an annual gathering of the nation’s most influential conservatives. Keene considers Obama “an anti-gun activist” who will likely attempt to revive a federal ban on assault weapons in his second term. A 10-year ban approved under President Bill Clinton expired in 2004. The NRA will advocate for a federal concealed carry reciprocity law that would allow gun owners with permits in one state to carry their guns in other states with similar laws. Forty-nine states — including Hawaii, where police chiefs have the discretion over concealed carry permits — have concealed carry laws. A concealed carry reciprocity bill was approved by the House in November 2011, but has not been adopted by the Senate. U.S. Rep. Mazie Hirono and U.S. Rep. Colleen Hanabusa, both Hawaii Democrats, voted against the bill in the House. “In order to cross the country with a firearm that may be legal when you leave your home, you need a lawyer, because it changes every few miles,” Keene said.